"Tanakh" redirects here. For Hebrew Bible: A Critical Edition, see Oxford Hebrew Bible. For the musical collective, see Tanakh (band). For places in Iran, see Tanak, Iran. Modern scholars seeking to understand the history of the Hebrew Bible use a range of sources, in addition to the Masoretic Text. These sources include early Greek (Septuagint) and Syriac (Peshitta) translations, the Samaritan Pentateuch, the Dead Sea Scrolls and quotations from rabbinic manuscripts. Many of these sources may be older than the Masoretic Text and often differ from it. These differences have given rise to the theory that yet another text, an Urtext of the Hebrew Bible, once existed and is the source of the versions extant today. However, such an Urtext has never been found, and which of the three commonly known versions (Septuagint, Masoretic Text, Samaritan Pentateuch) is closest to the Urtext is not fully determined. Tanakh is an acronym of the first Hebrew letter of each of the Masoretic Text's three traditional subdivisions: Torah (‘Teaching’, also known as the Five Books of Moses), Nevi'im (’Prophets’) and Ketuvim (’Writings’)—hence TaNaKh. The books of the Tanakh were passed on by each generation and, according to rabbinic tradition, were accompanied by an oral tradition, called the Oral Torah. The three-part division reflected in the acronym ’Tanakh’ is well attested in the literature of the Rabbinic period. During that period, however, ’Tanakh’ was not used. Instead, the proper title was Mikra (or Miqra, מקרא, meaning ’reading’ or ’that which is read’) because the biblical texts were read publicly. Mikra continues to be used in Hebrew to this day, alongside Tanakh, to refer to the Hebrew scriptures. In modern spoken Hebrew, they are interchangeable. Many biblical studies scholars advocate use of the term ’Hebrew Bible’ (or ’Hebrew Scriptures’) as a substitute for less-neutral terms with Jewish or Christian connotations (e.g. Tanakh or Old Testament). The Society of Biblical Literature's Handbook of Style, which is the standard for major academic journals like the Harvard Theological Review and conservative Protestant journals like the Bibliotheca Sacra and the Westminster Theological Journal, suggests that authors "be aware of the connotations of alternative expressions such as... Hebrew Bible [and] Old Testament" without prescribing the use of either. Alister McGrath points out that while the term emphasizes that it is largely written in Hebrew and "is sacred to the Hebrew people", it "fails to do justice to the way in which Christianity sees an essential continuity between the Old and New Testaments", arguing that there is "no generally accepted alternative to the traditional term "Old Testament." However, he accepts that there is no reason why non-Christians should feel obliged to refer to these books as the Old Testament, "apart from custom of use." In terms of theology, Christianity has recognized the close relationship between the Old and New Testaments from its very beginnings, although there have sometimes been movements like Marcionism (viewed as heretical by the early church), that have struggled with it. Modern Christian formulations of this tension include Supersessionism, Covenant Theology, New Covenant Theology, Dispensationalism and Dual-covenant theology. All of these formulations, except some forms of Dual-covenant theology, are objectionable to mainstream Judaism and to many Jewish scholars and writers, for whom there is one eternal covenant between God and the Israelites, and who therefore reject the term "Old Testament" as a form of antinomianism. In terms of canon, Christian usage of "Old Testament" does not refer to a universally agreed upon set of books but, rather, varies depending on denomination. Lutheranism and Protestant denominations that follow the Westminster Confession of Faith accept the entire Jewish canon as the Old Testament without additions, although in translation they sometimes give preference to the Septuagint (LXX) rather than the Masoretic Text; for example, see Isaiah 7:14. In terms of language, "Hebrew" refers to the original language of the books, but it may also be taken as referring to the Jews of the Second Temple era and Jewish diaspora, and their descendants, who preserved the transmission of the Masoretic Text up to the present day. The Hebrew Bible includes small portions in Aramaic (mostly in the books of Daniel and Ezra), written and printed in Aramaic square-script, which was adopted as the Hebrew alphabet after the Babylonian exile. The inter-relationship between various significant ancient manuscripts of the Old Testament (some identified by their siglum). Mt being the Masoretic text. The lowermost text "(lost)" would be the Urtext. There is no scholarly consensus as to when the Hebrew Bible canon was fixed: some scholars argue that it was fixed by the Hasmonean dynasty, while others argue it was not fixed until the second century CE or even later. According to Louis Ginzberg's Legends of the Jews, the twenty-four book canon of the Hebrew Bible was fixed by Ezra and the scribes in the Second Temple period. According to the Talmud, much of the Tanakh was compiled by the men of the Great Assembly (Anshei K'nesset HaGedolah), a task completed in 450 BCE, and it has remained unchanged ever since. The twenty-four book canon is mentioned in the Midrash Koheleth 12:12: Whoever brings together in his house more than twenty four books brings confusion. The original writing system of the Hebrew text was an abjad: consonants written with some applied vowel letters ("matres lectionis"). During the early Middle Ages scholars known as the Masoretes created a single formalized system of vocalization. This was chiefly done by Aaron ben Moses ben Asher, in the Tiberias school, based on the oral tradition for reading the Tanakh, hence the name Tiberian vocalization. It also included some innovations of Ben Naftali and the Babylonian exiles. Despite the comparatively late process of codification, some traditional sources and some Orthodox Jews hold the pronunciation and cantillation to derive from the revelation at Sinai, since it is impossible to read the original text without pronunciations and cantillation pauses. The combination of a text (מקרא‎ mikra), pronunciation (ניקוד‎ niqqud) and cantillation (טעמים‎ te`amim) enable the reader to understand both the simple meaning and the nuances in sentence flow of the text. The Tanakh consists of twenty-four books: it counts as one book each Samuel, Kings, Chronicles and Ezra–Nehemiah and counts the Twelve Minor Prophets (תרי עשר‎) as a single book. In Hebrew, the books are often referred to by their prominent first word(s). The Torah (תּוֹרָה, literally "teaching"), also known as the Pentateuch, or as the "Five Books of Moses". 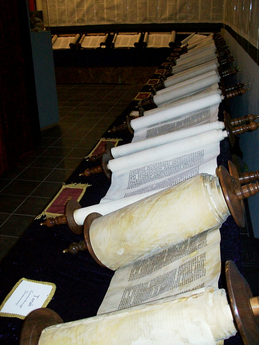 Printed versions (rather than scrolls) of the Torah are often called "Chamisha Chumshei Torah"" (חמישה חומשי תורה‎ "Five fifth-sections of the Torah") and informally a "Chumash". Nevi'im (נְבִיאִים‎ Nəḇî'îm, "Prophets") is the second main division of the Tanakh, between the Torah and Ketuvim. It contains three sub-groups. This division includes the books which cover the time from the entrance of the Israelites into the Land of Israel until the Babylonian captivity of Judah (the "period of prophecy"). Their distribution is not chronological, but substantive. Ketuvim (כְּתוּבִים‎, "Writings") consists of eleven books, described below. They are also divided into three subgroups based on the distinctiveness of Sifrei Emet and Hamesh Megillot. The Five Megillot (Hamesh Megillot). These books are read aloud in the synagogue on particular occasions, the occasion listed below in parenthesis. The Jewish textual tradition never finalized the order of the books in Ketuvim. The Babylonian Talmud (Bava Batra 14b — 15a) gives their order as Ruth, Psalms, Job, Proverbs, Ecclesiastes, Song of Solomon, Lamentations of Jeremiah, Daniel, Scroll of Esther, Ezra, Chronicles. The five relatively short books of the Song of Songs, the Book of Ruth, the Book of Lamentations, Ecclesiastes and the Book of Esther are collectively known as the Hamesh Megillot (Five Megillot). These are the latest books collected and designated as "authoritative" in the Jewish canon, with the latest parts having dates ranging into the 2nd century BCE. These scrolls are traditionally read over the course of the year in many Jewish communities. Besides the three poetic books and the five scrolls, the remaining books in Ketuvim are Daniel, Ezra–Nehemiah and Chronicles. Although there is no formal grouping for these books in the Jewish tradition, they nevertheless share a number of distinguishing characteristics. Their narratives all openly describe relatively late events (i.e. the Babylonian captivity and the subsequent restoration of Zion). Two of them (Daniel and Ezra) are the only books in Tanakh with significant portions in Aramaic. Tanach: The Stone Edition, Hebrew with English translation, Mesorah Publications, 1996, ISBN 0-89906-269-5, named after benefactor Irving I. Stone. There are two major approaches towards study of, and commentary on, the Tanakh. In the Jewish community, the classical approach is religious study of the Bible, where it is assumed that the Bible is divinely inspired. Another approach is to study the Bible as a human creation. In this approach, Biblical studies can be considered as a sub-field of religious studies. The later practice, when applied to the Torah, is considered heresy by the Orthodox Jewish community. As such, much modern day Bible commentary written by non-Orthodox authors is considered forbidden by rabbis teaching in Orthodox yeshivas. Some classical rabbinic commentators, such as Abraham Ibn Ezra, Gersonides, and Maimonides, used many elements of contemporary biblical criticism, including their knowledge of history, science, and philology. Their use of historical and scientific analysis of the Bible was considered acceptable by historic Judaism due to the author's faith commitment to the idea that God revealed the Torah to Moses on Mount Sinai. The Modern Orthodox Jewish community allows for a wider array of biblical criticism to be used for biblical books outside of the Torah, and a few Orthodox commentaries now incorporate many of the techniques previously found in the academic world, e.g. the Da'at Miqra series. Non-Orthodox Jews, including those affiliated with Conservative Judaism and Reform Judaism, accept both traditional and secular approaches to Bible studies. "Jewish commentaries on the Bible", discusses Jewish Tanakh commentaries from the Targums to classical rabbinic literature, the midrash literature, the classical medieval commentators, and modern day commentaries. Brueggemann, Walter (1997). An introduction to the Old Testament: the canon and Christian imagination. Westminster John Knox Press. ISBN 978-0-664-22412-7. Johnson, Paul (1987). A History of the Jews (First, hardback ed.). London: Weidenfeld and Nicolson. ISBN 0-297-79091-9. Kugel, James L. (1997). The Bible as It Was. Cambridge, Massachusetts: Harvard University Press. ISBN 0-674-06940-4. Leiman, Sid. The Canonization of Hebrew Scripture. (Hamden, CT: Archon, 1976). Minkoff, Harvey. "Searching for the Better Text". Biblical Archaeology Review (online). Archived from the original on 14 March 2012. Retrieved 9 June 2011. Noth, Martin. A History of Pentateuchal Traditions. (1948; trans. by Bernhard Anderson; Atlanta: Scholars, 1981). Schniedewind, William M (2004). How the Bible Became a Book. Cambridge. ISBN 9780521536226. Schmid, Konrad. The Old Testament: A Literary History. (Minneapolis: Fortress Press, 2012). ^ "Tanach". Random House Webster's Unabridged Dictionary. ^ Isaac Leo Seeligmann, Robert Hanhart, Hermann Spieckermann: The Septuagint Version of Isaiah and Cognate Studies, Tübingen 2004, pages 33-34. ^ Safire, William (1997-05-25). "The New Old Testament". The New York Times . ^ Hamilton, Mark. "From Hebrew Bible to Christian Bible: Jews, Christians and the Word of God". Retrieved 2007-11-19. Modern scholars often use the term 'Hebrew Bible' to avoid the confessional terms Old Testament and Tanakh. ^ a b McGrath, Alister, Christian Theology, Oxford: Blackwell, 2011, p. 120, 123. ISBN 9781444335149. ^ "Marcion", Encyclopædia Britannica, 1911 . ^ Davies, Philip R. (2001). "The Jewish Scriptural Canon in Cultural Perspective". In McDonald, Lee Martin; Sanders, James A. The Canon Debate. Baker Academic. p. PT66. ISBN 978-1-4412-4163-4. "With many other scholars, I conclude that the fixing of a canonical list was almost certainly the achievement of the Hasmonean dynasty." ^ McDonald & Sanders, The Canon Debate, 2002, page 5, cited are Neusner's Judaism and Christianity in the Age of Constantine, pages 128–145, and Midrash in Context: Exegesis in Formative Judaism, pages 1–22. ^ Ginzberg, Louis (1909). The Legends of the Jews Vol. IV : Chapter XI Ezra (Translated by Henrietta Szold) Philadelphia: Jewish Publication Society. ^ Also called Kinnot in Hebrew. 929 Chapters Links to Tanakh manuscripts, ancient and modern translations, dictionaries, related literature (e.g., Dead Sea Scrolls, Ancient Near East, Christian, Rabbinic), and study tools such as maps, photos, and archaeological websites. Hebrew–English Tanakh: the Jewish Bible Online edition of the oldest known complete Masoretic text of the Hebrew Bible (including cantillation marks) placed next to classic Jewish translation; can be used on most Internet-connected computers and mobile devices. Tanach on Demand – Custom PDF versions of any section of the Bible in Hebrew. A Guide to Reading Nevi'im and Ketuvim – Detailed Hebrew outlines of the biblical books based on the natural flow of the text (rather than the chapter divisions). The outlines include a daily study-cycle, and the explanatory material is in English, by Seth (Avi) Kadish. Tanakh Hebrew Bible Project—An online project that aims to present critical text of the Hebrew Bible with important ancient versions (Samaritan Pentateuch, Masoretic Text, Targum Onkelos, Samaritan Targum, Septuagint, Peshitta, Aquila of Sinope, Symmachus, Theodotion, Vetus Latina, and Vulgate) in parallel with new English translation for each version, plus a comprehensive critical apparatus and a textual commentary for every verse. Serve-A-Verse—Free online Hebrew Bible Explorer with audio, translation and transliteration of all 39 books of the Hebrew Bible.